Note: At the time of this writing the Recreation.gov information is wrong where it states the Sandy Beach campsites have electricity only. They also have water. Their info is also partially wrong where it says Shady Lane sites have sewer. Some do, some don’t. Essentially there are three campgrounds around Cedar Lake, and two less developed overflow areas. When it comes to the overflow areas I didn’t find those mentioned in any literature anywhere. 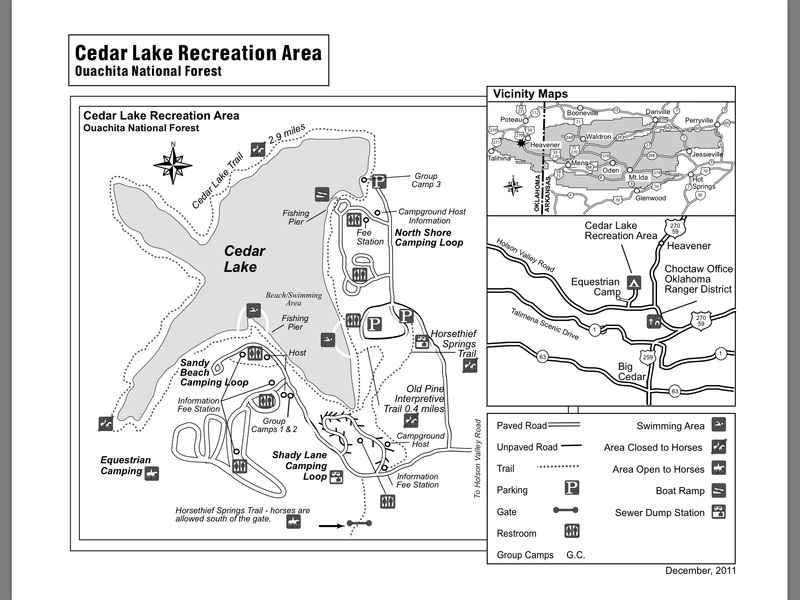 There is also an Equestrian Campground close to Cedar Lake which I did not visit and about which I’ll not comment other than to say it is accessed via a road at the entry to Sandy Beach Campground. SEASONAL: I don’t think so. From what I can tell they are open year round. RATES: From $6 in the Overflow areas to $25 for full hookups. Interagency Pass holders receive a discount but it may not be 50% in all cases. I saw many sites marked “$15 GA $10” where I believe GA means Golden Access. It’s my understanding that the USFS discounts the basic camping fee by 50% but regards hookups as extras which are not discounted, or some such thing. This map shows the campgrounds, parking, dump stations, etc. 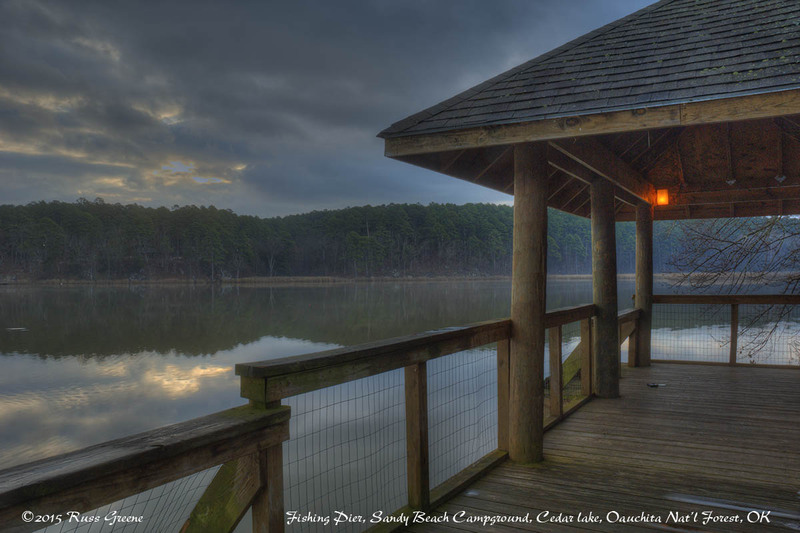 around Cedar Lake in the Oauchita National Forest in Oklahoma. ACCESS: Paved roads to and within the campgrounds except for one small, tight loop in the north Shore Campground. Overflow areas are grass and dirt, roads and campsites. I believe all three campgrounds have handicap accessible sites and restrooms but please double check as my memory is a little foggy on this point. SITES: I don’t know how many all told, but Recreation.gov seems to indicate 62 with at least some hookups. I don’t think they are including the overflow areas. PULL THRU: Not many, if any. None at Sandy Beach as I recall. MAXIMUM RIG SIZE: Many sites are small, others can handle pretty good size rigs. Recreation.gov lists sizes and I saw some 50′ and larger. SHADE: Yes, depending on the site. North Shore has the most shade but it doesn’t have hookups. This large overflow site was, if I recall correctly, in the Lower Overflow area near north shore campground. It was the largest of the overflow campsites. Service at Sandy Beach was iffy without my booster. SHOWERS: Yes, at Sandy Beach. I don’t know about the others. SHOWER RATING: Fail (Sandy Beach) (I evaluate showers in a similar fashion to restrooms. See above.) The water wasn’t hot enough and they had shower heads mounted on the wall that pointed almost straight down making it difficult to wet your head without smashing it into the wall. What idiots design these things? Sometimes I think that somebody should take them out back and beat them senseless. Morons! Either that or bureaucrats that don’t care or don’t know any better. Maybe all three. 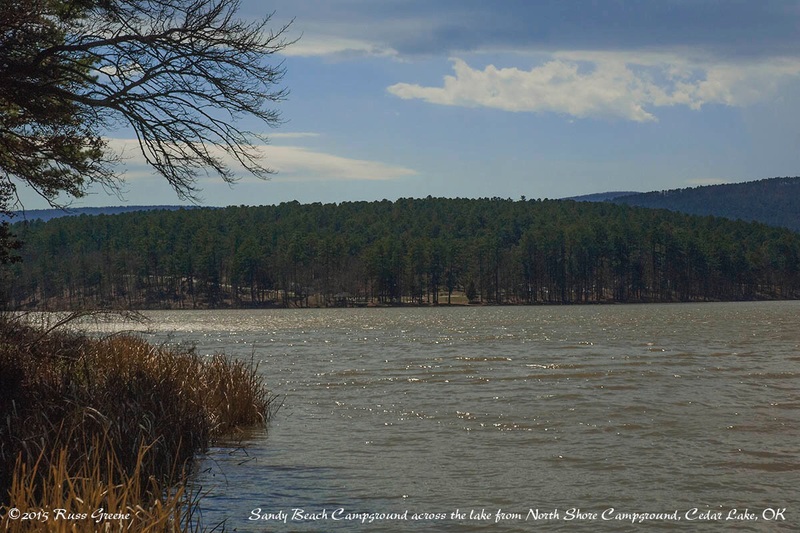 Campsites at Shady Lane Campground at Cedar Lake are in a Flash Flood Zone!?! What? Who’s idea was that? Propane: According to AllStays there isn’t any nearby, But I have otherwise been informed that Hodgen Butane in Hodgen has propane. The route I was taking was from the Imperial Dam LTVA near Yuma toward Tennessee, a state I had not yet visited. I chose a route of secondary roads that would keep me off the Interstates and take me through the countryside. This was true through Arizona, New Mexico, and the panhandle of Texas. All of these places have some beautiful country including the mountains of Arizona and the gorgeous orangy-red soil of northern Texas. I also followed a secondary-roads route through another state I’d not yet been to, Oklahoma. 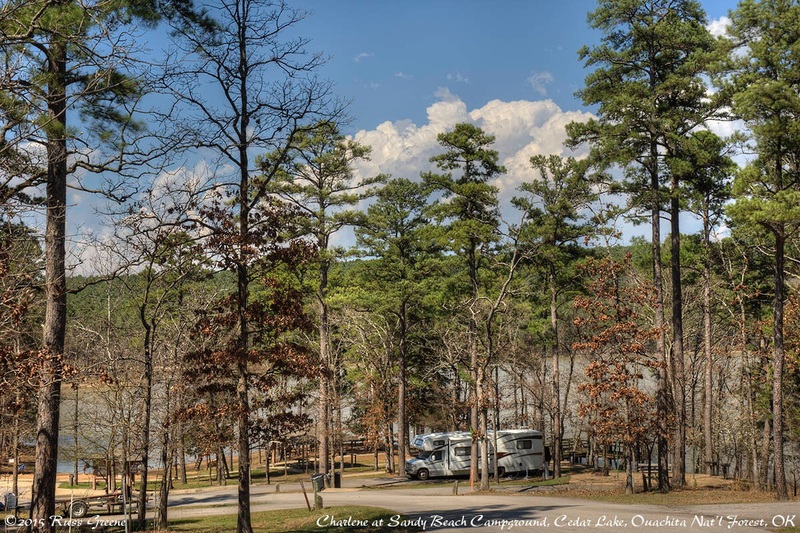 This route was south of I-40 taking me through the Ouachita National Forest where I stayed at Sandy Beach Campground after looking also at North Shore and Shady Lane–all three campgrounds are at Cedar Lake. North Shore has a more forested feel to it but it lacks hookups of any kind. Actually, there is one site to the west of the more southerly restroom which has a 30 amp receptacle on a pole that looks like a telephone pole but I’m not sure this is meant for campers. There is no accessible circuit breaker. The campground host did point it out to me, however, and said it was OK to use. There is a small loop at North Shore that is unpaved, with a narrow dirt road that big rigs may have trouble with. It’s easy to jump out and walk it to reconnoiter in a minute or so. Shady Lane has some sites with full hookups: water, electricity and sewer. Some sites do not have sewer but a dump station is right outside the campground. 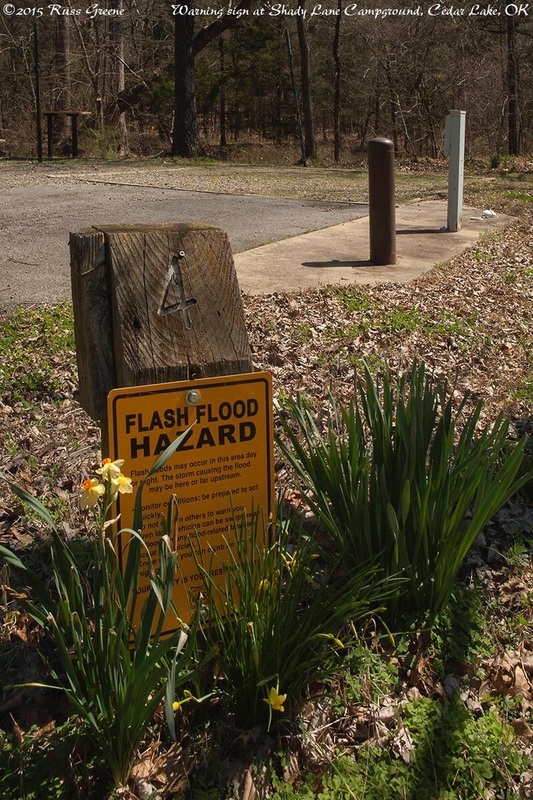 Some, if not all of the sites at Shady Lane are marked with signage warning that the site is in a flash flood area. I question the wisdom of building a campground in such a location. The second night of my stay at Sandy Beach brought with it sever thunderstorm warnings and I felt compelled to walk over to Shady Lane to let the one camper that was there know about the forecast. He already knew and elected to stay. in this shot you can see Sandy Beach from North Shore. Sandy Beach is the smallest of the campgrounds. Several sites are close to the water’s edge. Sites at Sandy Beach are paved and have water and electricity. 50, 30 and 20 amp if I recall correctly. There was room for my 33′ rig with maybe as much room left over in the site I occupied. Others may not be as large. The Recreation.gov site has site size info. All campgrounds have the feel of being in the forest but North Shore has more of that feel than the others. 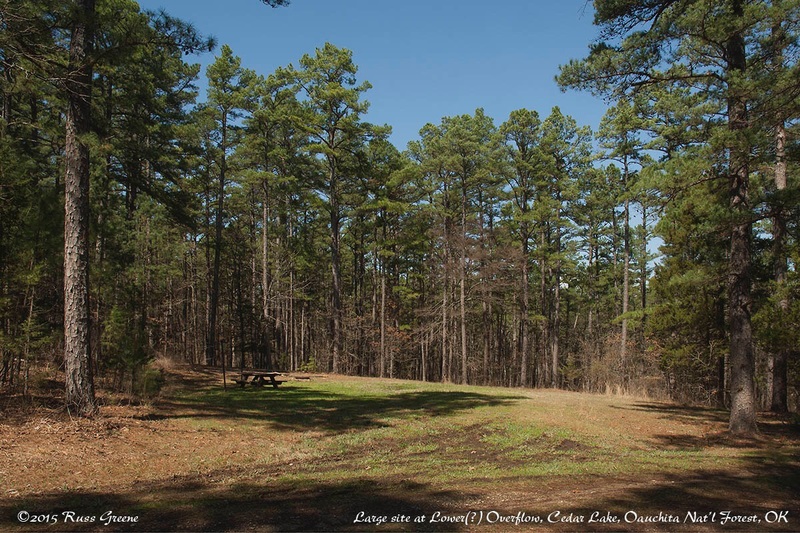 Besides the three campgrounds there are two overflow areas (see above for GPS coordinates). They were not marked. Each has about 10 camping areas. The gate to the Upper Overflow was closed and locked with signage saying the campground was closed. The Lower Overflow was open and one rig was using a site within it. I walked both Overflow areas. These are more primitive. There are no hookups. They are unlit. They each have a water spigot or two and a vault toilet. The roads through each, if you wish to call them roads, are grassy and dirt. These areas, apart from the fact that they have water and toilets remind me of areas in which I have boondocked before. I recommend walking these areas before going in with a vehicle. Signage at the Lower Overflow indicated a fee should be paid but there was no indication as to how much and no place to pay it. I spoke with a Forest Service employee who said the fee was $6 and it could be paid at the North Shore Campground which was just up the road. I presume that the fee would be $3 with an Interagency Pass of one flavor or another. Russ, appreciate the write up. It was instrumental in me deciding to go here for the weekend from Dallas, Texas. My kids and I loved it. Great, Mike, glad to hear it! Thanks for letting me know.